Being born and raised in Rwanda succumbed us to certain traditions and morals that govern our community. Many call it culture, we call it UMUCO. I believe and argue that the biggest weapon against [neo]-colonialism is knowledge and practice of one’s indigenous culture. Thus, I have devoted my life to Afrikan narratives, and to rescuing lost cultural prospects. Like many other Pan-AfriKanists, however, my love for my culture can make me very defensive about my identity. This is because I don’t think I mastered the art of how to balance or locate the co-existence of critique and appreciation of culture. This was my dissonance when it came to Umuco. Overtime, I had to learn that I can appreciate culture without being naive to the structures and systems that need to change. I pride myself on being Rwandan and even more being Afrikan. You cannot tell me we are not the source of all green in the plants, all brown in the soil, all blue of the ocean and all light of the sun and moon. Never! However, I have realized that many of us are yet to recognize, understand and accept that our cultures do not exist in their PUREST forms. Our cultures, as Afrikans, are products of many wars our ancestors fought against colonialism. There has been immense intermarriage of cultures. But even more so, they are very much products of miseducation through colonialism. They are [forced] synchronism (s) that were produced as a means of survival. Some of us know this and some of us have internalized the miseducation and teach it as the norm, the necessary, the Culture. Of course when these customs get deemed as culture, it becomes the responsibility of elders to teach new generations how to uphold them. You can imagine to challenge the validity of these praxis is immediately seen as challenging elders, also known as being disrespectful in an Afrikan household. Basically, social suicide! For the sake of this blog and just the fact that I am a woman, I will be addressing culture as it pertains to women. The fear of challenging elders is real and horrible for young Afrikan girls. The attempt to do so is portrayed as a source of shame upon our families, mostly through our mothers. They pay for our attempts to locate our voices because they are the the central cultural holders in many communities. Growing up I was told that to wear anklets, have nose piercings and get tattoos was the ultimate catastrophe for a young woman. If you wore an anklet, people called you Indaya (a prostitute). Nose piercings and tattoos were indications ko nta muco ugira (that you had lost your culture). It was usually attached to foreign people or Rwandan kids who were born and raised abroad. This was a sign of ikirara (i’m not sure how to translate this but maybe a spoiled person, maybe, idk). I never thought it was urgent to address this because I thought it would change[ I mean wearing earrings came around]. But I was reminded of this discourse when in May, after months of silence on Miss Rwanda Kundwa Doriane, articles came flooding in about how she’d gotten a nose piercing. From Igihe,it was made clear that this was done after she left Rwanda and headed to Canada. Again, attaching the act to foreigners. Even more, (THE MOST DRAMATIC), there was a doctor interviewed and asked whether there’s a possibility she may have done this while in Rwanda. He said “Mu muco w’u Rwanda ibyo bintu ntibibamo, biriya ni ibintu byo mu muco wo hanze” (in Rwandan culture, this does not exist, those are things in foreign culture). He continued to say, “Byavugwaga ko umuntu upfumuye amazuru ari ingaruzwamuheto y’uwamupfumuriraga amazuru” (ingaruzwamuheto means conquerer), which is a narrative that was formed during the settlement of white people in Rwanda. I have a Togolese friend, she comes from a culture that has even primary sources showing the incorporation of nose piercings and tattoos in their culture but it is still looked down upon. It is “forbidden” to do so in her household. It is un-Afrikan. I think I remember her telling me that one of her uncles told her that it was unheard of for a Togolese woman to be pierced. You can imagine my face when I heard this. I was like, so what did you tell him? She was speechless I guess. I mean what are you going to say? “Ehh excuse me uncle but it is actually our culture” then pull out google pictures? The disrespect! What we put on our bodies becomes public consumption. We have to hold family reunions and negotiations pertaining to an accessory that will be on our bodies. A friend of mine in Rwanda shared her story of being a young Rwandan with piercings. 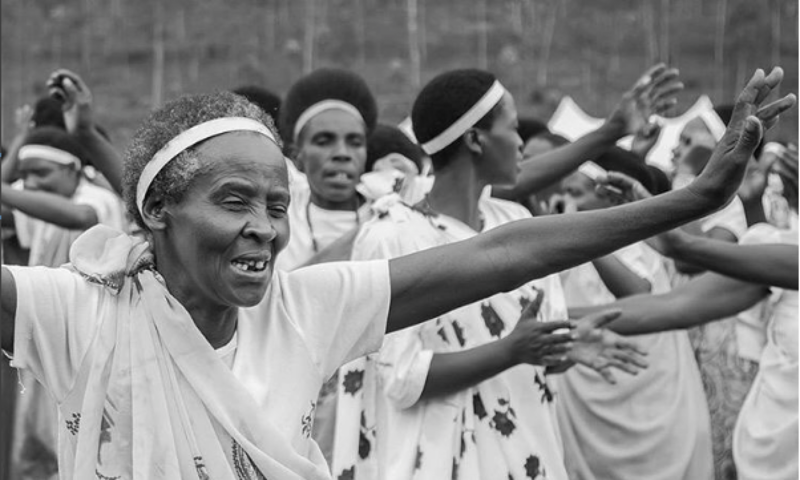 She said people told her “ubaye ikirumbo”, “waraguye” (as a Christian) and regularly got the popular “wabaye indaya”. She was forced to take out her piercing on various family occasions to keep her family “safe” from public talk. It is so interesting because she also told me about some homeboy who thought his opinion was so required that he told her if she did not have a nose piercing, she would have been perfect girlfriend material. When I got my piercing, I thought about the implications of it to me. Then after years of thinking about it, I got the piercing. Why? because I wanted it. I decided that because there was no correlation between my piercing and my ability to do anything, i should be able to do it. When defending my piercing, I have been better comfortable using the collective “Afrikan” experience rather than Rwandan experience, for a reason. But it is important that I put out here how hypocritical we are for choosing when to use our shared identity of being Afrikan. We always claim the shared “Afrikan” experience until you use other Afrikan cultures to make a point of challenging another. Never mind like I said, we have had a lot of cultural exchange- particularly Bantu people. Nose piercings are not “Un-Afrikan”, but somehow we teach them to be so. So I held myself accountable to living this truth. When I remembered how culturally women’s bodies do not belong to them but are property for others to consume, I decided it was even more symbolic to get one. We should not just accept UMUCO as it is given. You are allowed to question information given to you- to challenge it- and to fight to change things should you see fit. And UMUCO should not take away this privilege. If anything, Umuco is our defense. So this is about asking ourselves why the struggle to make such harmless decisions? What roles do we play in either breaking the stigma or reproducing it. UMUCO should not be a tool in silencing people and justifying it? UMUCO should not be about creating a box in which we keep people in regardless of if they suffocate? Umuco should not be built on seeing another person’s comfort as lack of our own. It is about plurality, fluidity and celebration. I have seen various Rwandan girls having these conversation and it is amazing. I see you all and your work. Continue to affirm yourself and what you believe in. Amazing. Absolutely amazing. This piece should be read by all who need awakening from coma colonial state. Keep up the great job Amata! This should be put up to create more awareness to people but especially to African girls. My sister who is now 26 years, before she got married she got a nose piercing because she had this huge love for spectrums. But like its always expected from our parents, my dad sent her out of the house for about 2 days, this really got my attention and at some point, to be honest I had an intense argument with my dad. Because just like my sister, we believe women’s bodies are not for mere consumption and approval. Plus we have to accept the fact that culture can change sometimes, just knowing the roots of where you come from is greatly enough. But anyways what my dad was mainly concerned about was how she was being a disgrace to the family and portraying a bad picture to other family members and friends. Despite of course the facts that my sister is a very hardworking, respectful person and well known for her good manners. But her nose piercing, of course had to out shine all that. Ppffsh. Mxmiou.!!! Thank you though, Amata. Nice work. After a friend suggested me to read this, I had this blog post saved in my reading list for weeks and finally I had the honor to read it. AND TO BE HONEST I SHOULD HAVE READ THIS AGES AGO (as any other munyarwanda). Thank you for bringing up the UMUCO conversation. Something that all of us should be able to speak about so freely but some of us are afraid to do so due to society’s stigma. Like you said, Umuco was shaped by people and like any form of human expression it can have evolutionary stages throughout our history. This post inspired me to raise my voice even louder. Thank you again! I have been reading your work for a while now. I absolutely admire your continued strive to not only be your true self, in this global society that worships conformism, but also your never-ending determination to keep growing as an intellectually informed and active Black Afrikan woman. I hope that you know how much you inspire us, at least me, to stand up and participate in the positive changes in our respective communities. Many, many thanks!